The State Department overnighted me a very thick packet of forms and information today. When I picked it up, I was expecting a simple envelope with a few forms in it - I was expecting this. And, to be sure, those forms were in the packet. But along with those forms came a hefty bit of other information. I'm an information-hungry kind of guy. I love receiving, processing, and categorizing information. In fact, when I was a freshman in college, I did a StrengthsQuest© personality evaluation, and my #1 strength is Input. Basically, that means that I constantly collect information and store it for later use. This is also why I'm a pack rat, but that's another beast. So, when I opened up the thick FedEx envelope today and found a wealth of information, I was both excited and immediately overwhelmed. At first, I couldn't read much of it. 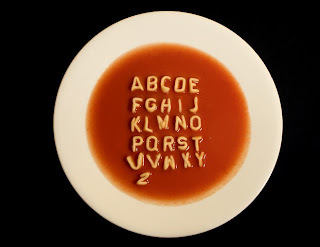 A long time ago, someone in the government was a huge fan of Campbell's Alphabet Soup, apparently [with a quick bit of Googling, I discovered it kind of got it's start with FDR and the New Deal. Interesting, huh?] There are about a thousand new acronyms to learn: CONUS, HST, FSI, FEGLI, FEHB, TD, TO, PCS, TDY, etc. I won't even bother defining those for you. In any case, it takes a lot of getting used to, although I seem to be making some headway in that area. The 2010 Guide to Federal Benefits for Federal Civilian Employees is 113 pages long. It details all of the options I have in choosing my health benefits, plus dental, vision, life insurance, and long term care insurance. Let me suffice the entire booklet to say this: I'm overwhelmed. There are numerous options, conditions, and requirements to consider. Then I need to evaluate my personal risk tolerance in choosing a plan. Then of course, I have to plan for my retirement, even now, at age 23. This is all new to me. Of course, that booklet is just one of numerous collections of information. There's an 80 page guide to moving around the world and from home to Washington. Then there's a packet or two on various non-profit organizations out there to support Foreign Service officers. A DC metro map. A pamphlet on Virginia's Luray Caverns (no idea why that's there.) A booklet about the Thrift Savings Plan. And, of course, plenty of forms. I was speaking with my college mentor today, and I told him that this is really the first time I've come up against something of which I really have no prior knowledge. I've never had my own health benefit plan because I've always been covered under my parents. In fact, I've never had any benefits to speak of. There are a lot of things I don't understand; but it's not because it's overly complicated, it's just that I've never dealt with these things before. Am I intimidated? A little. Does that excite me? You better believe it. In the coming days, I'll be evaluating all of this information and beginning to process it in my mind. It's true... my life is completely changing. But I love adventure, and I look at all of this as the next big adventure for me. I figure that's enough boring you for today. Maybe I'll post something interesting soon.